Get access to the service for window cleaning Camden trusts with one quick call to Top Window Cleaners today! We're the local favourites for glass cleansing that gets powerful results when you need it most, offering you free quotes and round-the-clock customer support so your highly affordable window cleaning services go ahead with no hassle and no fuss! 24/7 customer care and support - we support both our commercial and domestic customers around the clock. Broad range of booking slots, so you can fit us in around working hours or busy days. Fantastic value for money! And a free quote whenever you ask for one. Fully insured window cleaning service! 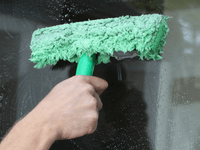 Save with our special deals combine your window cleaning with conservatory cleaning or another service and benefit from our attractive discounts! And get it from a highly trained staff of specialists! 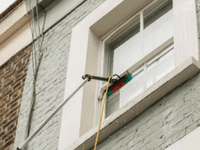 The Camden professional window cleaning team use advanced water-fed extension poles to clean up to 23m from the ground - usually the fourth storey of your property. These poles mean we stay on ground level, and you get to keep all of your privacy! You'll see the team run a hose from the water tank in our van to your property - which is why we ask for a parking space within 30m - and then set up the poles, which purify the water on its way to your glass. Purified water results in mineral and chemical-deposit free windows, and a natural drying process that'll leave your windows shining! Get a professional help for your residential window cleaning. Polish the windows with the assist of the commercial window cleaners. 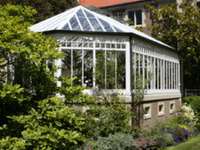 Protect your conservatory from dirt and dust for a long time. Dialling 020 3404 9775 is the simple way to arrange the window cleaning services you need in Camden. Because we offer 24-hour a day customer support and service, you can reach us over the phone, or online via our contact form or chat facility at your convenience. At Top Window Cleaners we're always just a five-minute call away!